No one would disagree that trees are a constant in our daily lives. 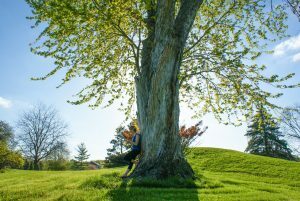 There are countless benefits of trees that have powerful influences to humans and nature alike. Trees provide habitat for wildlife, they also provide food, conserve energy, save water, and even clean air. Without trees, our life on this earth would be impossible. I like to use trees as a metaphor for explaining the role of educators. After all, just like trees, educators provide so much for students and have powerful influences in their lives. We are familiar with a saying, “Teachers plant seeds that last a lifetime”. As an educator myself, I consider my role as a teacher the most worthwhile and rewarding part of my life. For all educators, to be a part of a person’s growth process is more exciting than anything else. Just like trees, educators have powerful influences on students. These positive influences come under a very important condition. The tree itself must be a healthy tree. If the tree is not in a healthy state, then everything else collapses. So, what does it mean for a tree to be healthy? How can a tree continue to grow in a healthy manner? If a tree is not connected to its source of growth and life, there’s going to be major problems. That is why prophet Jeremiah wrote, “Blessed is the man who trusts in the Lord, and whose hope is the Lord. For he shall be like a tree planted by the waters, which spreads out its roots by the river, and will not fear when heat comes; But its leaf will be green, and will not be anxious in the year of drought, nor will cease from yielding fruit” (Jeremiah 17:7,8 NJKV). There cannot be any kind of growth unless it is connected to the source of life. Same with educators. If the educator is not connected to the source of life and stops growing, then the impact of influence will inevitably fade away. Ellen G. White emphasizes the importance of spiritual growth: “There can be no life without growth. The plant must either grow or die. As its growth is silent and imperceptible, but continuous, so is the growth of character. At every stage of development our life may be perfect; yet if God’s purpose is fulfilled, there will be constant advancement” (Education 105.3). If we are not connected to the source of life at all times, teaching will become more of a work rather than a meaningful vocation. Through the example of a tree, we can learn how to be effective and influential educators. Let us be firmly grounded in Christ and continue to grow in order to give. Let’s GROW DEEP, AND LIVE TALL. Il Mok Kim, Ph.D., currently serves as Professor of the Graduate School of Theology & School of Theology, Head Chaplain and Senior Pastor at Sahmyook University. He has served as Chair of the Theology Department, Dean of the Theology Dormitory and Men’s Residence Hall.